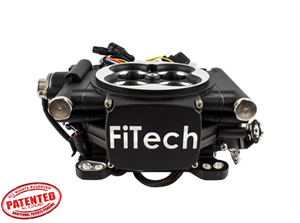 The Go EFI 4 Self Tuning Fuel Injection is rated at 600 HP but is suitable for engines from 250 HP thru 600 HP. 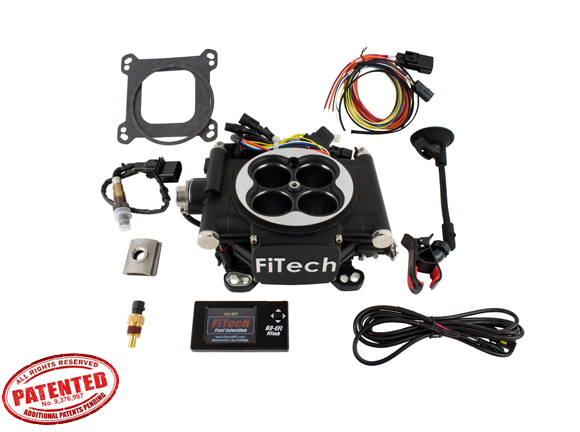 This system is perfect for your everyday Driver right up to your weekend Street Machine or Bracket Racer. It features the FASTEST most accurate Self Learning available, Timing control, Wet flow Annular discharge and tons of additional features. (4) Hi-Flow 600 HP injectors. Initial setup is quick and easy. Simple touch screen selections get you up and running in minutes. Self-tuning** After startup the ECU immediately takes over and provides your vehicle with an optimum tune! Uses a Bosch 4.2 wide band O2 sensor while all other sensors are easily replaceable GM style parts. Throttle bodies have a completely universal base to fit any 4-bbl manifold. All Go-EFI’s feature Voltage Control fuel pump control. This feature reduces the voltage to the pump under low load conditions such as idle and cruise thus reducing noise and heat. This will extend the life of your pump and keep the fuel in the tank cooler and your ears from ringing! Go-EFI Systems feature Wet flow technology and have a unique Swirl Spray Annular discharge design that assures COMPLETE ATOMIZATION!! Check out our videos, you need to see it. Air Fuel ratios can be optimized on the fly as you drive! Try that with your Carb. Part #30001 & #30002 feature 1 adjustable fan control switch. Built in Fuel pressure regulator. No extra regulator to mount on your fire wall.